Chen Ching-Yuan, the (flare-s), 2013. Video installation (still). Courtesy of the artist and TKG+. Brief biography: b. 1984 Taiwan. Lives and works in Taipei. Chen Ching-Yuan’s works focus on the dilemma of the unstable and feeble perceptions generated when one has to face an uncontrollable and tremendous pressure. Working in a variety of different media, including painting, video and installation, Chen Ching-Yuan often uses visual metaphor to articulate the ambiguity and perplexity of national politics and internal reflections of identity. 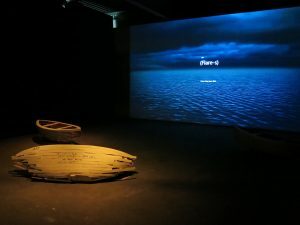 the (flare-s) enjoyed a UK Premiere in 2014 in Harmonious Society, a major exhibition curated by Centre for Chinese Contemporary Art (CFCCA) (with support from the University of Salford) as part of Asia Triennial Manchester, 2014. 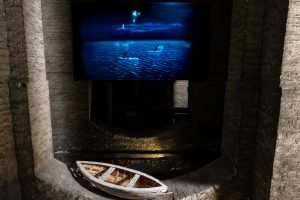 The artwork is is an installation made up of a looped animation and worn lifeboats that are illuminated at intervals by spotlights. The animation shows a sea at night where waves constantly sound and wooden boats drift into view. A lone figure occupies each boat and they take it in turns to send rescue signals up into the night sky. As help fails to come, more and more flares are ignited, the sound of rockets exploding creating an unsettling cacophony: these signs and sounds of crisis paradoxically become celebratory fireworks as the boats sink. Ching-Yuan’s animation work focuses on the dilemma of misunderstanding and the terror of being faced with uncontrollable and unstable situations. Chen Ching-Yuan, the (flare-s), 2013. Installation photograph at St. George’s Hall by Pete Carr. Exhibitions include: PRESENCE: A Window into Chinese Contemporary Art, St. George’s Hall, Liverpool (2018); unfinished portrait, mor charpentier, Paris, France (2018). What am I? If I can’t be yours, TKG+, Taipei, Tawain (2016); Un title, ITPark, Taipei, Tawain (2015); (flare-s), TKG+, Taipei, Tawain (2013).